I’ve been pretty crappy in this whole RESIST! thing. Yes, I wrote the letter(s) and yes, I keep thinking—thinking matters!—but I see exhortations to Do X! Y! Z! on Twitter, and I’m, like, Um. . . .
WELL, I’ve finally found something which suits my house-bound ways: I’m gathering information for the Resistance Manual, on online, open-source, er, source of resources. I’ve already added citations to the readings list, as well as plugged in data for Wisconsin, New Mexico, and Minnesota. It’s all pretty basic, thus far, but you don’t get to the complicated stuff without that basic foundation, so I think I’m, y’know, actually contributing something. Oh, and I did, finally, manage to call my Congressfolk: Rep Clarke (Thanks for boycotting the inauguration! ), and senators Gillibrand (About those Sessions/Price/DeVos votes. . . ?) and Schumer (Yeah, vote against Sessions! Yeah!). Schumer’s DC line was way busy, so I called his Manhattan office—hell, it all gets to them. Like many people, I’ve developed a thing, which is to say, a problem, with calling people I don’t know. Pre-email I never would have won a cold-calling award, but now that there are ways besides actually phoning to people I don’t know I prefer. . . not to phone people I don’t know. It’s a bit of an issue. Anyway, my friend T. mentioned that she’s programmed her politicians into her phone and I thought, Hey, that’s a mighty fine idea. Then, once I did that, I thought, Hey, why not actually, y’know, maybe, call ’em. So I did. It was nothing, as of course the rational part of me knew. They don’t know who I am, they don’t care how eloquent I am, if they saw me on the train they wouldn’t point and giggle She’s the lady who stammered her comment, and they’re not writing Ms. Absurdbeats of Lefferts/East Flatbush called to say. . . .
Nope, all that mattered was that I gave an opinion on something the rep/senator did, and they noted that. So, if you’re like me, not crazy about cold-calling politicians, don’t worry: they have people, and those people know how to write Right On! or Ugh! and then politely issue you off the phone and not think about you again. And I bet that when I do call again, they ain’t gonna remember me—which is just how I like it. Oh yes, I liked and retweeted that sign! 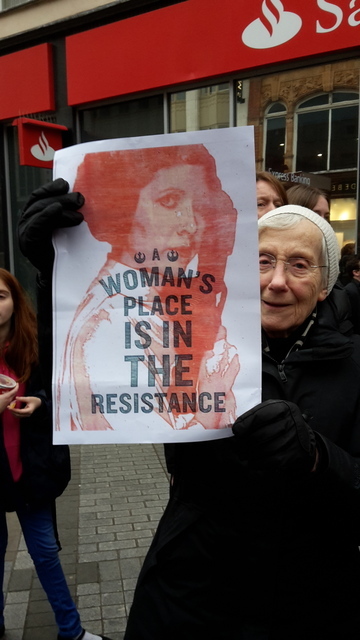 There were a number of great Princess/General Leia placards. “Let a new earth rise”—lovely!